Looks like teething for Baby T will be a long and painful process just like with Baby E. With our first, the teething tablets helped immensely, but with our boy nothing is working for him. I was willing to try anything! I was extremely skeptical about the amber baby teething necklaces that I have read other moms praising. How could it possibly work? Sure, succinic acid in the amber may act as an analgesic to reduce pain and it is anti-inflammatory. But how much could it possibly help? That's what my initial thoughts were. After many painful screaming sessions with Baby T I decided it is worth a try, what have I got to loose? Best decision ever. Amber Regina sent us two teething necklaces, this multicolored one and the dark untreated one. Why two? Just imagine the surprised look on my three year old girl's face when she would find out her brother gets a necklace to wear and there isn't one for her! The first day he wore it, it seemed as though his teething pains were extra horrible. He was screaming in pain and I was curious to see what would happen as he actually wore it longer. Two days later my mother came over, I forgot he was wearing it - so she asks "Has the necklace helped at all?" I then realized that I didn't notice how well he slept the past two nights, he woke up to nurse only once! That was very rare for him. We have been wearing it for two weeks now and overall, he seems to be in so much less pain. Honest. Instead of screaming fits where he chews on anything and everything, tugs at his ears, and drools puddles - he is now a lot calmer, more smiley, and when it is apparent teething is bothering him he just gnaws on something, drools a little, and almost never cries. It looks like the amber teething necklace has taken the edge off the pain and it is a lot more manageable for him now. As for Baby E, of course she isn't teething any longer! But she makes it a point to put on her special 'just for little girls' necklace every morning when she wakes up. We have received many compliments already! I love that this is genuine Baltic amber and the necklaces are handmade in Lithuania - a big deal for me since I lived in Latvia for ten years and anything amber is right up my alley! We had amber artwork in our home, my mother wore amber jewelry, and I still have an amber brooch from my childhood years. It does make me rather nostalgic! I love that these are made especially for infants with a knot between each bead so that all beads do not come off in case it is broken. It is so solid though, I don't see how a baby could break it, it would need a lot of force. The necklaces are 12.5" long, it fits well on both my infant and toddler. My toddler loves jewelry, but I am wary of putting something cheap on her that may contain lead, cadmium, and other heavy metals. This all natural, non-toxic kids necklace is a much safer alternative. They are very reasonably priced at $11.50 to $14 each. Oh, and in case you are wondering, they have absolutely gorgeous amber jewelry for adults too. 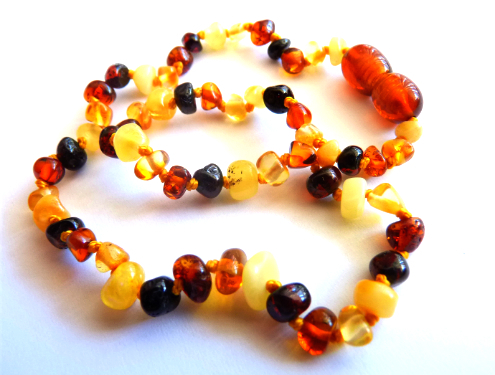 One of you will win an amber teething necklace for your baby! I would love to try one of those, although none of my kids were terrine when they were teething, my little girl started biting everything she can get ahold of. Homeopathic tables not helping much. I love the Baltic Amber Faceted Earrings Honey! I'd like the dark untreated necklace for my 6 month old boy! Other than the Baby Teething Necklaces, I love the Baltic Amber Unique Faceted Champagne Drop Necklace! I love the teething necklace in yellow for my 5 month old. I also love all of the adult jewelry, especially the pandora charms. My 10 year old daughter would love those. I love the Baltic Amber Baby Teething Necklace Yellow T3! I love the Baltic Amber Multicolored Chunky Necklace. I like the Baltic Amber Faceted Earrings Honey. I love this! I like the natural look of the beads. I like the Baltic Amber Baby Teething Necklace Multicolored. Teething necklaces are parent's biggest consolation although constant supervision is necessary. We can never too sure how the babies deal with beads, especially if babies have strong grips and tugs hard on anything.